The Nokia N95 was announced in late 2006 and it shipped in early 2007, not long before the Apple iPhone came out. The N95 represents Nokia at the peak of its market power, and it represented a new class leader that competitors - including Apple - had to beat. It was an impressive device, no manufacturer had packed so much into a phone before, and indeed it took other manufacturers some time to catch up.. and Nokia's leap forward left many rival firms stranded with out-of-date devices. Although we think that many Mobile Gazette regulars are pretty familiar with the N95, a quick run through of the specs might still be useful. On the front was a 2.6" QVGA (240 x 320 pixel) display with a video calling camera and two-way slider. On the back was a very decent 5 megapixel camera with Carl Zeiss optics, a flash and VGA resolution video capture capabilities. Inside, the N95 supported 3.5G data, WiFi and had a GPS receiver. The N95 also came with a pretty capable multimedia player, stereo speakers, an FM radio and 160MB of flash memory upgradeable through the microSD slot. There was also 3D graphics acceleration and a relatively speedy 332MHz CPU to push everything along. Launched way before "app stores" made smartphones truly smart, the Nokia N95 shipped with the Symbian S60 OS which could have applications loaded with a bit of effort. Despite some fiddliness, the N95's flexible built-in software combined with the ability to add a wide range of other applications certainly stirred some real interest. 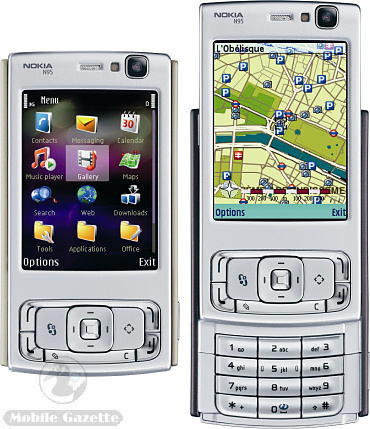 The N95 represented a steady evolution of Nokia's designs and capabilities. Nokia must have felt very comfortable in the steady succession of devices - especially N-Series handsets - that they had produced up until this point. But even before the N95 made it to market, the whole market was turned upside down by Apple's announcement of the iPhone. What happened next was one of the biggest face-offs that the mobile phone industry has ever seen. The iPhone was nothing at all like the N95, but it pitched to the same sort of tech-savvy customer base.. plus it brought a whole load of diehard Apple fans along with it. In hardware terms, the N95 seemed to have the edge. The iPhone didn't support 3G, it came with a relatively poor camera with no video capture, there was no GPS or FM radio. It wasn't until 2008 that Apple opened their App Store, so most iPhone customers were stuck with the apps that the iPhone shipped with. Despite these technical weaknesses, the iPhone had a large touchscreen and a beautifully polished interface which made Nokia's S60 implementation look very out-of-date. We know now that the iPhone would become a huge hit, this in turn would spur on the rival Android operating system to become the biggest smartphone platform in the world, effectively squeezing Nokia out of the market. But at the time, the iPhone's success against Nokia's range was by no means certain. Nokia wasn't complacent though, and they quickly replaced the N95 with the Nokia N95 8GB, a sexier black design with a larger screen, bigger battery and 8GB of non-expandable memory. The N95 8GB shipped towards the end of 2007, but despite the improvements the obvious lack of touch technology was even more apparent on the new 2.8" display. 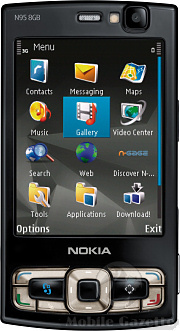 In fact, Nokia failed to come up with a touchscreen phone until more than a year after the N95 8GB was launched. Despite the age of the phone, there is a lively secondhand market for the N95 8GB on eBay, with unlocked models in good condition selling for over £100 / €110. So if you have a good condition N95 8GB in a drawer then it might just be worth something..